“Penny Bee, go to SLEEP!” I hear Mama’s not so happy voice. She is standing at the bottom of the stairs. How did she see me? She went away, she went to the downstairs. She kissed me good night, and put the covers on me, and closed the door. But I didn’t want to sleep. I felt wrong lying down. I saw the sunshine on the white window curtains. My legs felt hot and twisty under the covers. I needed to check on the dolls in the toy box. Somehow Mama saw me get out of my new, big girl bed. Mama knows everything I do. “Do you want me to come up there?” If I hear crackle and scratch on the stairs, she is coming up to my room. That means I am bad. No, I don’t want that! My bare feet run to my bed and jump me onto my big, bouncy kingdom. I make the covers float over my head, like a cape I can fly with, or the magic carpet story Daddy reads from a big book. The book has pictures that tell other stories, too, about princesses who dance every night, or a little man who turns straw into gold. People in stories know how to do things I can’t do yet. “Penny Bee, I don’t want to hear you out of bed again!” I don’t want to be bad, but I can’t make myself stay lying down. I want a story. Pages in books have stories that you tell by looking at the pictures. I can tell the story, too. I don’t need Daddy. I crawl to the foot of the bed, under the covers the whole way so I am invisible. Mama can’t see me if I am under the covers! No one can see me! I reach out to the dark brown box where the books squeeze against each other. Here’s one with a rabbit with hearts on his tummy, and a tree with big cat who smiles and a little girl who knows how to go through a mirror to Another Real Place. Everything in the story picture is so pretty – a big party table and tall, fancy cake in a garden of flowers. I want to go there. Go into the book. Then, I can touch the flowers and taste the cake. How do I do that – go into the book? I look at each flower, to see if it is real. At last I find a part of the picture that is really alive – the little rose bush on the corner of the page. The color of the petals hums the way a real flower does, and the leaves open and close, sipping in air. Now all I do is squeeze down very tight. I pull all of myself into the real live roses, and crawl under their petals. Here I am! Inside the book! The grass feels cool under my bare feet. Everything shines like the sun is inside it – the sky and the clouds and even the wind. I can hear voices. “Hi, honey,” they say, “You’re home.” It must be the roses. I knew they could talk. To my great excitement, I came across a course description for a topic that doesn’t turn up too often at photo conventions: therapeutic photography. Since the entire purpose of this blog is to explore photography as an intuitive practice for self-reflection, I was thrilled to find a kindred soul. 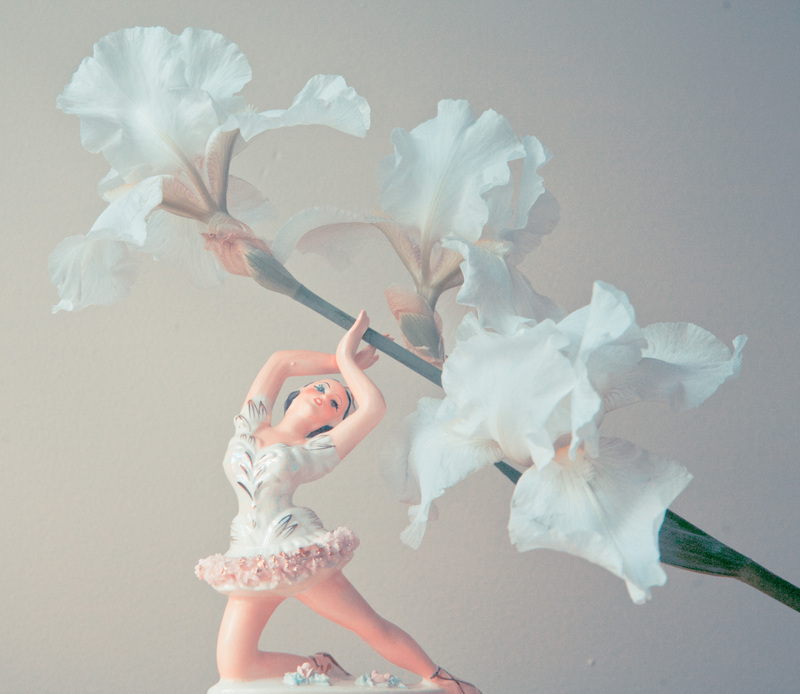 Presenter Megan Dill’s self portraits and still-lifes eloquently portray her inner life. The sense of hope in her images is palpable, even visceral, yet in the generous shadows typical of her work, you can see Megan honors the painful prerequisites that launch us on our search for wholeness and meaning. I hope she will offer her presentation on-line sometime – I would love to share this journey with her! For myself, tonight I need a little fanciful, to take my mind to elsewhere. Twirling into dreams of petals as feathery as butterfly wings, that is where my inner dance is leading – a little fancy, full. For Sunday coffee hour, my friend Liz cut irises from her front yard and brought them to our spot (Victor Allen’s on D’Onofrio) in a heavy clay vase, glazed verdigris. “I just wanted you to have some flowers,” she offered, setting them down on the deep orange of the wooden side table between our chairs. The cafe is decorated quite darkly – mohair armchairs the color of clotted blood, deep brown floors, walls no lighter than coffee with a splash of cream. 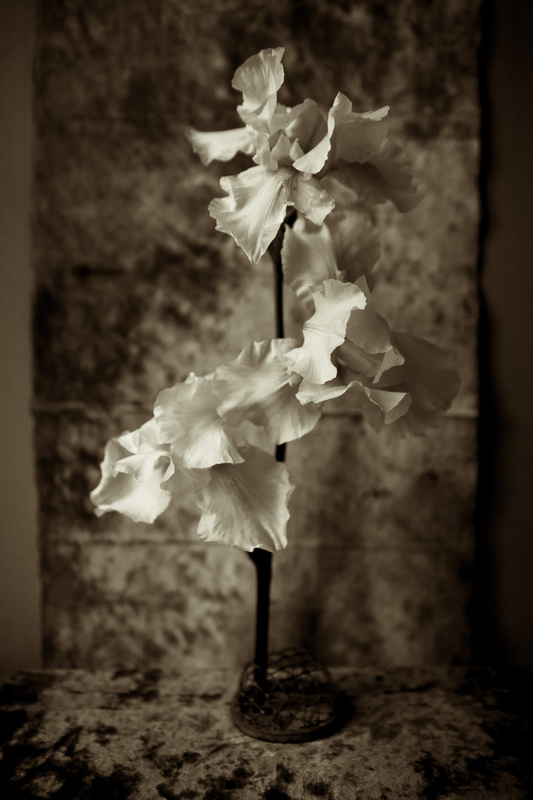 The irises towered like white clouds in the modest light reflected from the parking lot. Outside, other customers absorbed the warmth of a June day we’ve waited so long for, filling themselves with a little extra buzz of sunshine. Liz and the irises and I had the place to ourselves. Usually, I have the presence of mind to take a picture when I feel that inner clang pointing toward something ordinary and beautiful, but yesterday I had practically no mind at all. Which, sadly, is just another way of saying I was all mind – bedeviled with thoughts and anxieties so persistent and familiar I have all I can do simply to sit still. So I missed that moment when the irises took hold of the entire room, perfecting the light and the dark with their own unrestrained becoming. Taking our cozy seats across from the irises, Liz and I told the events of the week in their presence. “Oh, don’t they smell wonderful!” Liz observed, distracted in mid-sentence. “I can’t really smell them,” I said, leaning in to see what she meant. “You can’t? !” She was astonished. The irises made it home with me intact, in a big plastic cup with one of those domed lids meant to protect the whipped cream on your confectionary beverage. As I compared a few props against them, I caught myself hoping that making a picture would help me feel better. There’s no kindness in letting this sort of expectation get the upper hand. “It hurts now,” I told myself. “It’ll probably still hurt when I’m done photographing.” I taped up some backgrounds that I like, and took my spot on the little step stool next to the bright window. Maybe it was the warmth of the car on the drive home, or the stillness of watching the beckoning layers of petals, but unexpectedly, there it was. A sharp, juicy-fruit scent, as thick and purple as the irises were white and tender, radiated from them like chimes echoing into summer twilight. I did stop. I did drink it in. I can’t make a picture of it. You just had to be there. A friend from grade school posted our 5th grade class picture on Facebook. In it, I am 9 years old – a little too young for 5th grade. The explanation is simple: due to a gross bureaucratic error, the Chicago Public Schools accidentally hired a gifted teacher for our first grade class. In June of 1972, 22 of her students tested with reading scores too high for 2nd grade. In September of 1973, nearly our entire class skipped to 3rd grade, and our gifted teacher was – of course – laid off, thus restoring the natural order of professional mediocrity to Lincoln School. Fifth grade was okay. In Social Studies, we watched a series of perplexing movies about Eskimos. The boys loved it when the Aleut father carved up raw seal meat and fed it to his children. Our science teacher – Kasimir Micah – tricked me into inhaling ammonia as an “experiment” in class, leaving me crying and gasping for oxygen. (He was my first true sadist – I’ve known a few others, two of them teachers.) We took ballet, and went on sleep-overs, and turned 10 that April. At the Chicago Park District field house where we went for ballet class, a neglected lilac bush drooped over the landing at the top of the cement stairs. 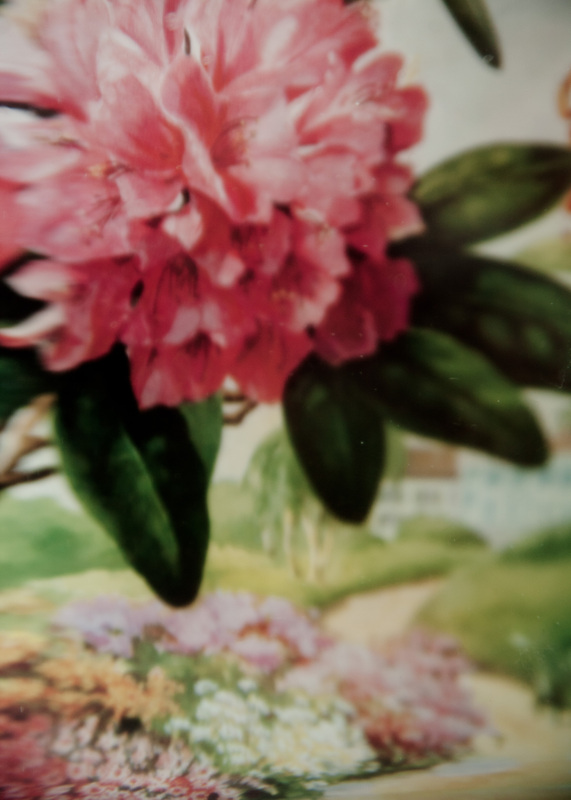 When Miss Mazur excused her brood of ballerinas for a break, Pammy and Cheryl and I curtsied with the earnest drama of dying swans, and scurried outside to smell The Lilac. Jostling to reach the closest branches, we scuffed our pink tights and slippers with rust as we leaned against the crumbling painted iron railing, and pulled the curtain of perfume against our noses. 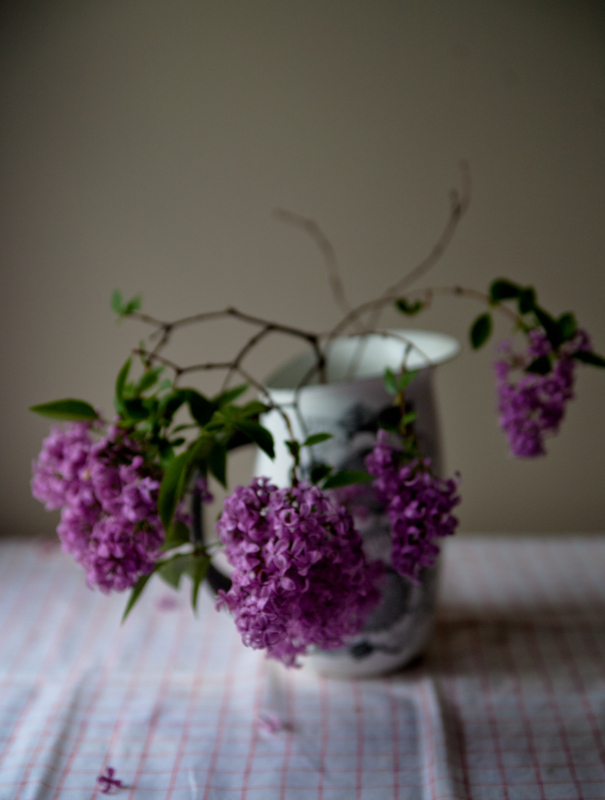 At 10, I conceived The Lilac as belonging completely to me. 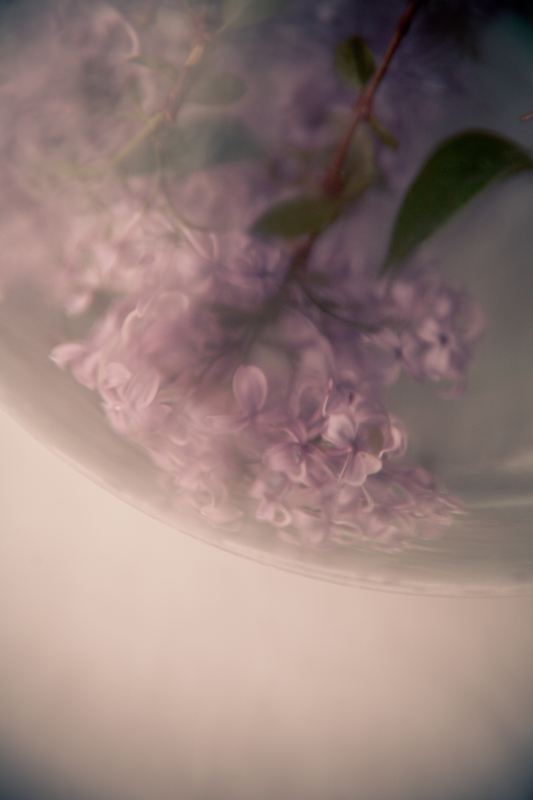 I inhaled its scent as if I could become A Lilac, until Miss Mazur would send someone outside to find us. Dreamy with pleasure, we might spin and leap through the stale dark hallway, back to our barres to turn out our feet and point our toes, trailing gravel and paint chips across the studio floor. I don’t look that different from the 9 year-old in the 1973-74 Lincoln School class picture. My face has reclaimed the roundness of a self with little to gain from prettiness, a self who is on the outside of a certain feminine territory where she simply doesn’t belong. Instead, I crawl beneath branches hanging so low their panicles of flowers tangle in the grass. I’m sure I look ridiculous, my orthopedic work shoes poking out from under the twigs and leaves, as if a tornado dropped a Lilac Bush on the Witch of Lake Woebegone. Overhead, birds chatter and swap places between old thick limbs carrying their load of spring treasure as close to the sky as they can. 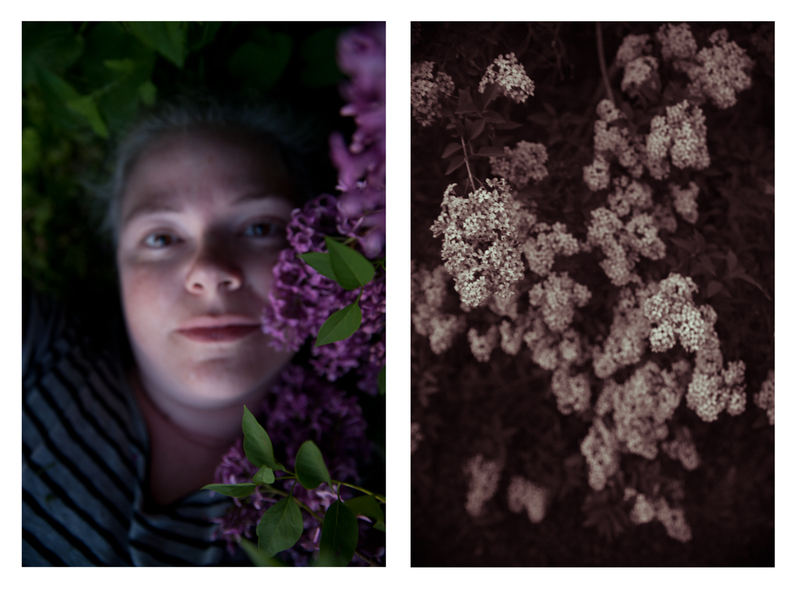 I pull a cluster of lilacs closer, my whole being permeated with their breath. I lie there as long as I want, until it is almost too dark to take pictures. As I walk home, I feel like dancing. No. I haven’t really changed that much at all. a constellation of petals underneath the surface. They came inside, but they didn’t linger long. I gave them plenty of water to drink, but it didn’t help. They spent their perfume with me for a few hours, and while I dreamt, they died. It doesn’t matter. Everything about them was perfect for a moment. We went back to the Rosey Tree, whose pinkness is so ample, so sumptuous, so bosomy, she cannot help but be an ancient creature. 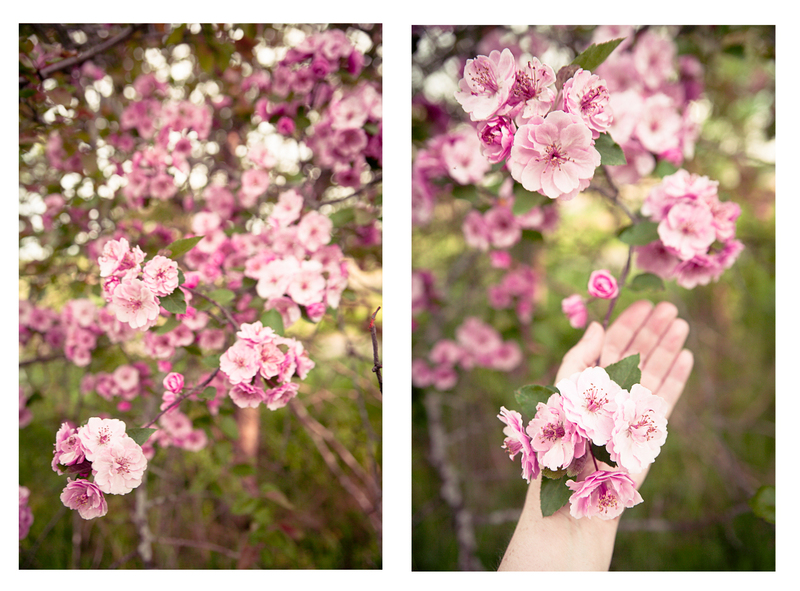 “Oh, look how few branches are blooming,” my friend Liz said as we took out our cameras. “She was full last year!” I knew Liz was right, but I didn’t want to agree. I want my Rosey Tree to be ok. “The winter was really hard on her. Maybe the buds froze,” I say. In past years, Rosey Tree overwhelmed me. Enumerating even the tiniest twigs, bubbles of petals dangled like ripe cherries, unfolding into clustered bouquets like perfect, tiny cabbage roses. 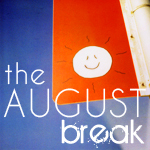 Engulfed in their profuse re-iteration, my emotions would careen between panic and delight. Even as I surrendered my heart to the hope that Rosey Tree herself would somehow transcend my clumsy camera work, my thoughts would rush forward to anticipate the inadequate pictures I was making. I never even noticed the scent of her blossoms. Rosey Tree’s flowers have a delicate fragrance, like dainty gift soap, or honeysuckle. This year seems to me to be Rosey Tree’s finest. 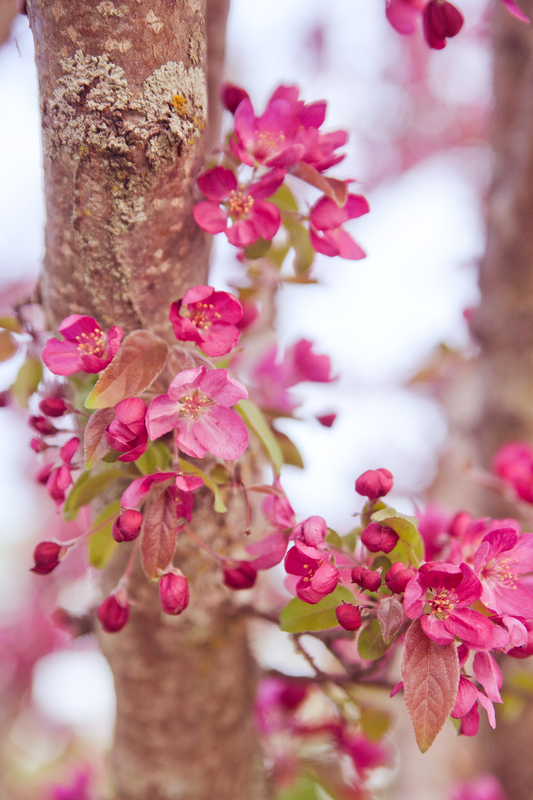 Her branches sparsely decorated, her blooms more widely opened than I remember – she is exuberant, not rampant. That she had something, anything to give this year – after the brutal cold could have stripped her of every tender node – has only made her lovelier. At last, I felt I could get close to her – close enough to recognize her scent, to find the form of her branches and to experience her endurance. I found a sense she welcomed me, and I was happy to find myself in her home, once more. 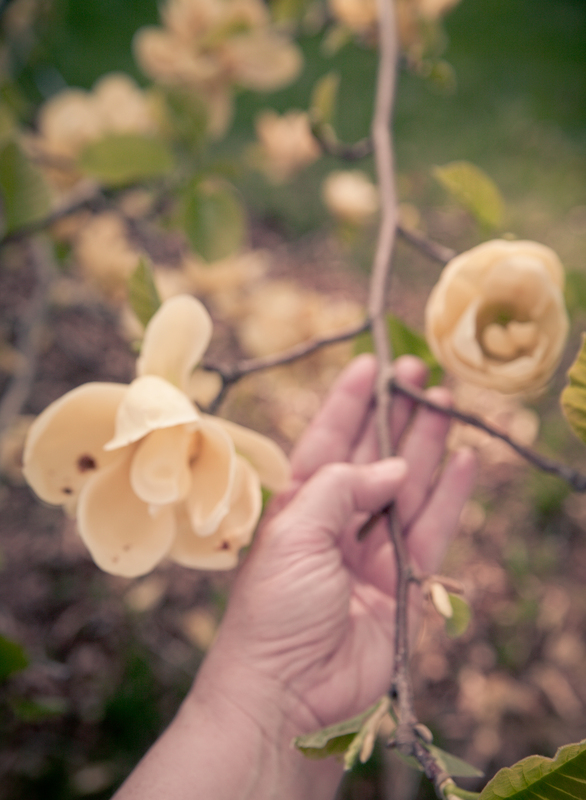 Turns out – the yellow magnolia were not quite finished being magical. Honestly, there is just more pinkness surrounding me than my eyes can hold. Reaching out for one-at-a-time flowers, single and human in scale, brings the pinkness closer somehow. Even if, in this case, the pinkness is creamy yellow. Really, Brenna? 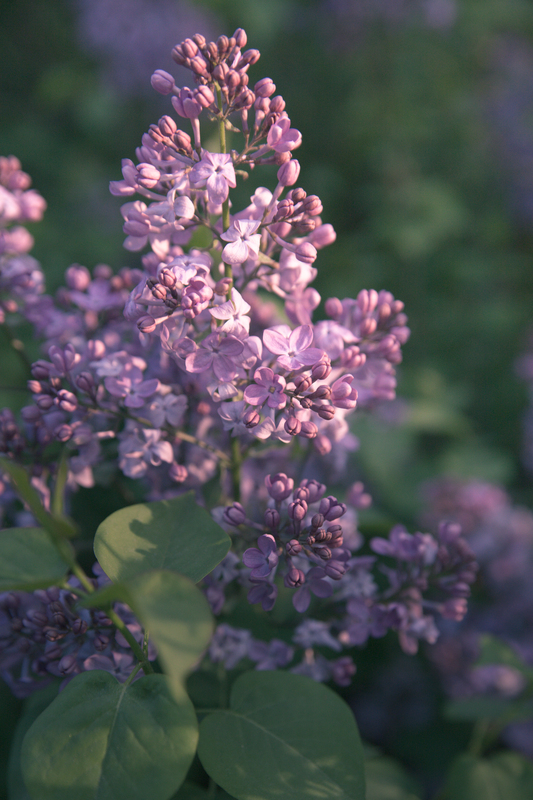 How long can it take to post about lilacs filling the air with the scent of honey and vanilla, so that any living creature is bound to surrender, to submit their will and ask, how can I help you pollinate? Answer: Eternity, and a lunch hour, give or take.